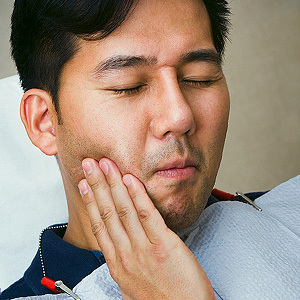 Chronic jaw pain can make eating, speaking or even smiling difficult. What's more, finding the right treatment approach can be just as difficult. This is because TMD (Temporomandibular Disorder: named for the joints on either side of the lower jaw) actually describes a wide range of possible problems with the joints and connecting muscles. Any of them can result in impaired jaw function, radiating pain or even headaches. We'll need to conduct a full dental and facial exam to accurately diagnose your jaw pain's cause. Even then, the way may still not be clear: there's considerable debate among dentists about the best treatment approach. Two basic schools of thought prevail, one conservative and non-invasive and the other more aggressive and interventional. The conservative approach seeks to alleviate symptoms in a variety of ways, including recommending softer foods to give muscles and joints time to relax, applying cold and heat to ease soreness, massage of the jaw joint muscles, gentle stretching and jaw exercises. We may also prescribe medications like ibuprofen and other non-steroidal anti-inflammatory drugs for pain and swelling relief, and sometimes muscle relaxers to reduce spasms. If your pain stems from clenching or grinding habits, we could fit you with a custom bite guard you wear while you sleep to reduce the forces on your teeth. The more aggressive approach is much more invasive. These methods include altering the bite or teeth position with orthodontics or dental work or surgically altering the joints themselves or the shape of the jaw. If you're recommended one of these more aggressive treatments, you should know they're not commonly used to treat TMD and they're irreversible. There's also no guarantee you'll gain relief from your symptoms, so by all means get a second opinion before undergoing any procedures. For most people the best course of treatment is to start with the least invasive techniques, which are usually very successful. If they don't relieve your pain and limited function, we may then consider escalating treatment to more irreversible procedures to help you find relief from this unwelcome condition.